Busta Rhymes, French Montana, and Dave East also join in on the posse cut. A$AP Ferg assembled a hot posse for the "East Coast Remix." 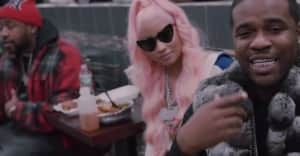 Originally only featuring Remy Ma, the song now has features from *deep breath* Busta Rhymes, Dave East, A$AP Rocky, Rick Ross, French Montana, and Snoop Dogg. The track comes from Ferg's upcoming project Still Striving, which is due out on August 18. To hold yourself over 'til then, Ferg has given you the chance to listen to seven different rappers do their thing on the new track. Stream "East Coast Remix" on Apple Music.